Redesigning classrooms is an idea that has been brought up throughout this past school year in my district. Many ideas that have been brought up would cost a lot of money. After completing readings this week and watching videos, I realize that it’s not about the actual materials, it’s about the flow of the classroom and the differentiated learning environments. The article “Wanna Improve Education? Demolish the Classrooms,” Trung Le talks about a school in Denmark that removed classrooms completely. While this is a radical and expensive change, there are ideas in the article that can be applied to redesigning my own classroom. In the article, Le explains that self-contained classrooms are replaced with different spaces for learning which promotes self-directed, interactive, and collaborative learning (2010). This is the vision I used when redesigning my own classroom. After reading “Chapter 2: Minds at Work” from the book, The Third Teacher, I began to relate my classroom layout to the Theory of Multiple Intelligences and how “[t]he one-size-fits-all idea really isn’t acceptable anymore,” (OWP/P Architects, VS Furniture, & Bruce Mau Designs, 2010). I differentiate my teaching, why am I not differentiating my classroom? “Howard Gardner’s Multiple Intelligences Theory is asking the designer of the learning environment to consider a variety of learning spaces…” (OWP/P Architects, et. al, 2010), and that is what I did when I redesigned my classroom. I didn’t want students to have a seat that they must go to and stay in every day. I wanted to provide differentiated learning spaces so students can choose how they learn, which will “illuminate their strengths” (OWP/P Architects, et. al, 2010). This past school year I found myself often telling students to sit in their seats. I had active boys who preferred to stand at their desk and work, while others preferred to sit on the floor with a clipboard. At first this seemed chaotic to me. I felt that all of my students needed to be sitting in their seats at their desks. I did have students’ desks arranged in groups of four so they were still able to work together. What I needed to do was realize that my students were trying to create a learning environment that worked best for them but I was not letting them. 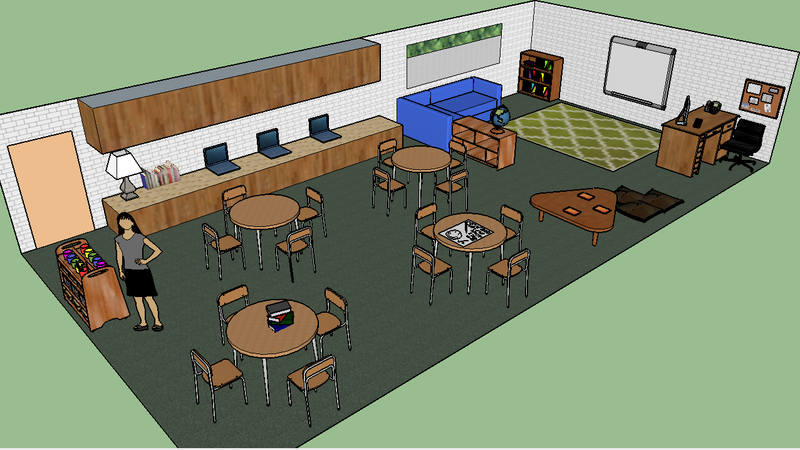 My redesigned classroom will allow students to choose how they want to learn. I have created a classroom with four tables. I always thought that clustering desks was allowing students to work collaboratively. However, students are still bound to their own desk; having to awkwardly lean across the table or move their chair up to another student’s desk to work closely together. I envision my redesigned classroom having tables. This will allow for students to easily move around their workspace to work together. It will also serve as a more communal mini-learning environment, as opposed to desks where each student has his or her own space. This style of learning will promote collaboration and give students a space to work together to create their own learning. My school has tables available to use so this would be no additional cost, I would simply have to switch out my desks. In my redesigned classroom I also have one table that is low to the ground. This will serve as a learning space for the students who don’t want to sit in a chair all day. I wouldn’t anticipate this to be a costly change, I am sure I can find a coffee-type table to repurpose. Similarly, I will also provide floor pillows. These are easy to move around so individual students can create a comfortable learning environment anywhere around the room. This would also be a cost-effective addition. Along one wall of my classroom I have a lot of counter space. Right now, it is cluttered with papers and materials. I would like to de-clutter this space and create a “genius bar”, like the classroom in Edutopia’s Remake Your Class video. This provides a work station where students can stand and work. The last area of my redesigned classroom is the new reading corner. I currently have a couch, however I wanted to create a space that is separated from the rest of the room. This area will give small groups the space to work together. I believe these small changes to my classroom will have a huge impact on student learning. By giving students the option to choose from a variety of learning environments, I am ensuring that each student’s needs are being met and that they are learning in a way that is most meaningful to them. Edutopia. (2013, March 14). Remake your class. Retrieved from https://youtube.com/watch?v=jXjEcnaYAmc. Le, Trung. (2010, Aug. 24). Wanna improve education? demolish the classrooms. Retrieved from Fast Company website https://www.fastcodesign.com/1662178/wanna-improve-education-demolish-the-classrooms. OWP/P Architects, VS Furniture, & Bruce Mau Design. (2010, April 1). The third teacher. Harry N. Abrams; First Edition.